View the status of, troubleshoot, and configure Best Practice Rules from the details page. Within each category, the rule name, importance level, current status of the last scan, and schedule are shown. 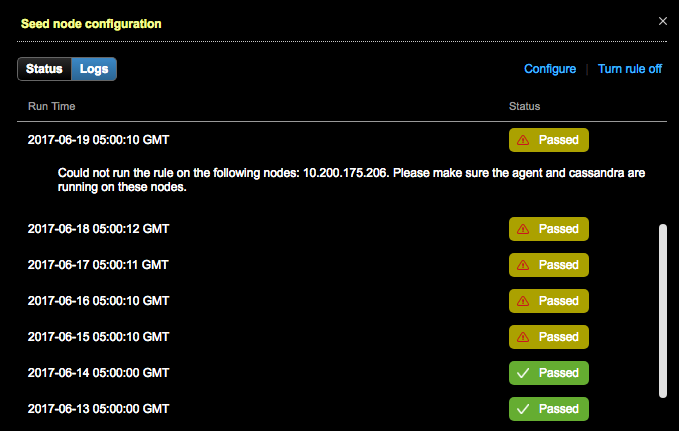 The Configure and Turn rule off links enable fast access to configuring rules or turning rules off and on. The total number of active rules that have passed or failed displays at the top right. Clicking the Pass or Fail number filters the rules to display only those that have either passed or failed. Click Expand All to view the all of the rules within each category. Click Collapse All to view only the Best Practice categories. Failed: The rule did not pass the last scan. Investigate the failed rule. 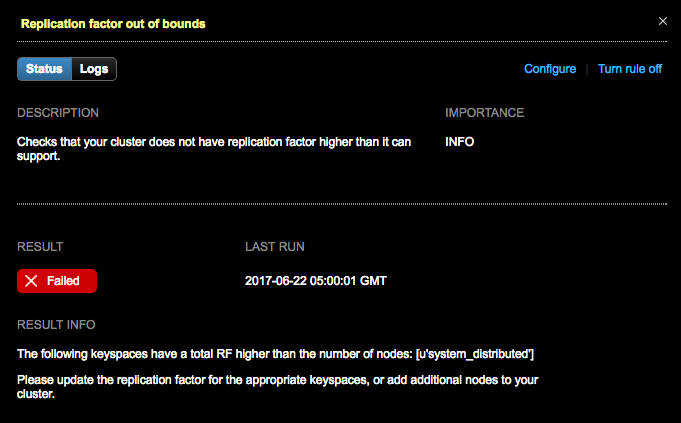 Passed (with warning): The rule passed but due to most likely an agent connection issue, the rule could not run on one or more nodes within a cluster. Investigate the rules that pass with a warning. Be sure to check agent status. Passed (no issues): The rule ran successfully without any issues. Any rules that are deemed high importance should be investigated and resolved before those of lower priority. Click Passed or Failed to get more info on a rule. The window displays a description of the rule, the importance level of the rule, and the date and time that the last scan was run in the Status view. If there are failures, the window provides a detailed message about the rule failure, including what caused the rule to fail and how to correct the failure. To view log history of a rule, click Logs. Click a Run Time item to view its details.